It's World Book Night in the US - something I read about last month - and wanted to share with my readers. 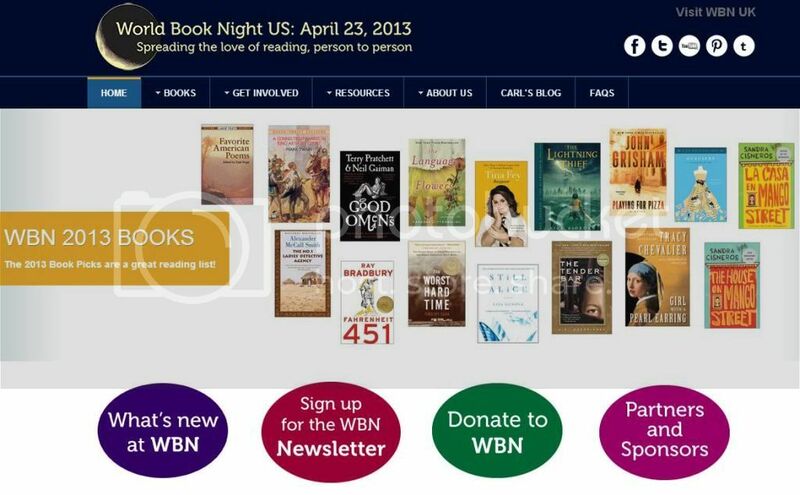 Its a great celebration of the love of reading, where "book givers" handout preselected books to light and non-readers. Because of Baby L's impending arrival, I figured this wasn't a good year for me to volunteer to be a "book giver" but I'm thinking about doing it next year. If you are interested in the list of books for 2013 - here it is. I've only read 6 of them myself - and added a few of the others to my Goodreads to-read list. The one I'm most excited to read from this list is Good Omens: The Nice and Accurate Prophecies of Agnes Nutter, Witch. I love Neil Gaiman books. If you'd be interested in helping out a great book lover event like this - sign up for the newsletter (or donate.) Oh, and if you're on Goodreads be sure to friend me... I love seeing what other book lovers are reading!